One of the hottest forms of “heat” used to temper one’s martial arts knowledge is the act of immersing oneself in the world of combat. While it is understandable that many Kung Fu practitioners do not engage in the study of the arts for fighting–one should not profess to teach combat and self-defense if he does not participate in any form of fighting. In fact, it is actually unethical for teachers to claim to teaching fighting and self-defense if he trains students in a sterile, sparring-free environment. One can learn forms for the next 40 years, develop the ability to perform all manners of acrobatics, and learn to do forms with all types of weapons, but without actually engaging in sparring–and to do so with strangers–the ability to defend oneself or someone else will be very weak. This is perhaps one of the biggest shortcomings of today’s traditional Chinese martial arts: More than half of TCMA schools do not participate in sparring and many that do so, do it at a low level of skill. This is not a judgment of teachers who dislike sparring; it is just a statement of fact. A popular discussion among TCMA teachers is a debate about whether or not the Chinese martial arts have remained relevant. The truth is, we have. We are very relevant in the modern martial arts world. We give our students an outlet to lead healthier lives, introducing many students to a form of self-discipline, we are a connection to the Chinese culture, we take children off the street and give them a safe activity that builds self-esteem, fitness, good manners, and more. Where we have not been very relevant is in the minds of the potential student who needs martial arts study for their self-defense needs. Whether they are police officers, prize fighters, security guards, or regular every day citizens concerned with self-protection against muggers and criminals–the term “Kung Fu” seldom enters the conversation. Few Sifus would dare to intervene in their own lives to stop a streetfight; I doubt if many would ever offer students to a local business as security or bodyguards. Pause. I think I heard someone say, that security and bodyguarding has nothing to do with Kung Fu. I beg to differ. There was a time, in the very recent past, that Kung Fu Sifu provided most of the security, soldiers, and bodyguards to his community. My own system of Jow Ga began not as a school teaching martial arts students–but a family teaching combat to soldiers. Almost all of us trace our systems back to someone who pioneered some form of combat–so why are we now shunning this use for our systems? While agreed–Kung Fu is so much bigger than fighting in today’s society, it is–the martial arts still must fill that need. We must keep our skills useful enough so that any of us who completes our curriculum is qualified to work as a bodyguard or provide unarmed security. If not, why not just remove all strikes, punches and kicks from our curriculum and call what we do “a form of exercise”? Many Sifu have avoided combat so long, they are actually reluctant to let a student who is interested in fighting actually do it. Many have gone so far as to tell students that sparring would impede their combat skills!! I have seen a friend in recent years here in California, do his best to talk several students out of participating in sparring, when a few of these students originally signed up just to learn to fight. What we see today are cases of many teachers projecting insecurities and feelings of inadequacy about their own fighting skill onto their students. In the end, the students suffer. They must then spend the rest of their days in just as much fear of a mugger as any non-martial artist, wasting all that classroom training time. They must spend the rest of their lives suffering from cognitive dissonance, convincing themselves that somehow–forms practitioners are more prepared to defend themselves than actual fighters, because the fighters are competing in a sport–while the forms practitioner is doing “real” combat training. They must spend the rest of their lives pretending to be self-confident around tough-looking individuals, when they are relying on dialing 9-1-1 for protection, just like the next guy. They must spend the rest of their lives practicing their arts as hobbyists, instead of the warriors they fantasize that they are. All because Sifu did not let them leave the nest to explore the life of a fighter; not even for a short period of time. In 1979, my Sifu arrived back in Asia–in Taipei, Taiwan–accompanied by a team of men he trained to compete at a full-contact Kung Fu tournament. He left for the U.S. 11 years earlier as a young man, wanting an American education and armed with martial arts as a vocation. in ten short years, he had trained some of the best fighters in Washington, DC., and he set out for this tournament to put them up against the best fighters in the world. No man returned empty-handed. This very young Sifu, not yet 35 years of age, had accomplished more in a decade than most men reading this article. With this one tournament, he established the DC lineage of Jow Ga as a fighting school, whose students should never have to fear or be subservient to any other martial artist. And he did it, not for his own reputation–but for theirs. He allowed each student to have this experience for himself, proving to themselves, their opponents, the spectators, and the world–that their training had not been in vain. Most members of the team were young men who had never traveled anywhere, some still in their teens. They returned to America, as newly matured martial artists who had fought the best the world had to offer. Some had trained in Jow Ga fewer than five years at that point. For the rest of their days, they were able to say they had traveled internationally and competed against the best of the best. How much did their Kung Fu grow with that experience? I’ll tell you, an entire universe more than many who have never dared to leave their own cities, let alone their own teachers’ classrooms. This “leaving the nest” need not be halfway around the world, however. Students simply need to be set free from the confines of the school and the protection of the Sifu. They need the freedom of using their martial arts without being corrected or coached. They need to be able to try out the ideas they formulated in their heads while practicing–that their Sifus may not have allowed them to try. They must know what the sting of an unseen strike feels like, they must feel the unbalancing of missing a step while launching or evading an attack. They must experience the fatigue of having run out of energy while still under pressure from the opponent–and then still having to protect himself. Students must understand what it feels like to see a man who scares you, and fight him anyway. They must learn to see, recognize, create, and exploit openings. They must feel the emotional rush of having defeated an opponent. They must know what it feels like to have dominated an opponent, and have the wisdom and compassion to back off and not go for the kill in order to salvage the opponent’s dignity. They must learn to recognize attacks and defensive strategies and choose the appropriate method to counter them. There are so many lessons that can only be learned when the training wheels are off, we do them a disservice if we deny them these lessons because of a personal bias or fear. So often, we imprison our students in the walls of our protection, they must sever the relationship with us just so they can free themselves from those shackles in order to learn. Don’t be that teacher who must be escaped from because a student wants to learn what the world has to offer. Students can only learn if they accumulate a combination of good experiences and what some erroneously label “bad” experiences. A real champion is not one who has never been beaten. A real champion is one who has faced the best–even facing those who are better than him–and then become champion anyway. The greatest lessons, many times, are taught by defeat and these “bad” experiences. And nearly ALL of this knowledge is only found outside your doors. There is a saying that is appropriate here, which says: “The only bad experience is the one you don’t learn from.” It’s one to live by. Let your students lift off so their knowledge base and skills can fly. If you enjoyed this article, please subscribe so you will be notified when we have new articles. If you are a Jow Ga practitioner, any lineage, please visit our shop on the main page to see Jow Ga offerings. We have three, some offering through this blog, some for all lineages, and some specifically for DC Jow Ga lineage. Thank you for visiting the DC Jow Ga Federation. During Sifu Chin’s last few years with us, I spent a lot of time learning from him in the gym before classes began. It was here, beginning around 3 p.m., and ending shortly before the first students arrived for the two hour class at 6 p.m. I got to hear conversations between Sifu Chin and my Si Hing Tehran Brighthapt, who had a special relationship with Dean Chin as one of his best fighters. On Sundays, training with Sifu started with class at 10 a.m., which Sifu Raymond Wong normally taught–unless Sifu decided to crash the class. Whether or not he so decided, Sifu taught shortly after lunch when Raymond’s class ended. Then on days when Sifu didn’t come to the school–usually on Saturdays, my brother and I would walk down South Glebe Road in Arlington, Virginia, and practice at Sifu’s house. One of my strongest memories was the smell of Dong Quai tea, cigar smoke, incense, and Dit Da Jow, as Sifu’s practices involved him sipping on the tea–which he drank for headaches–while he puffed on his cigar, incense for the founders, and Jow because Sifu believed strongly in conditioning. If you were to take Jow Ga from me versus some of my training mates, you would notice the difference of how I teach the art, because I teach how I was taught. Training with Sifu was rarely formal. There was no Gin Lai at the beginning and ending of class. Actually, each time Sifu taught a technique, he expected a Gin Lai. Normally, I would arrive from school (Sifu had given me a key to the school when I was 13) before him usually, to do homework. When Sifu arrived, he would send me out to fetch his tea and a cup of Onion Soup with dried noodles. After a short talk, or me reading magazines while Sifu and Brighthapt chat while people-watched, Sifu would tell me to go into the gym and practice. I use to daydream that he would show me some amazing new form, weapon or a super-technique that would empower me to whip everyone. Instead, what I learned was the value of hard work, attention to detail, and occasionally, something that was not on the curriculum. Something unique that was between me and him, that I could only practice alone–to be revealed at some function when Sifu would tell me, “Go and do that form.” I took a lot of pride in that relationship, because I learned a piece of Sifu Chin that most of my classmates did not know existed. I beat the drums and learned his favorite rhythms and powerful drumming technique that only a few could duplicate. Once he told me that a shop owner told him that when he heard me playing the drums, he thought it was him. Sifu spent a lot of time on the same few forms, and we did the same applications over and over for common techniques that everyone did differently. Only years later would I realize that this was the “Dean Chin version” of those techniques. And through the conversations with him, I learned the DNA of his fighting logic. While some folks chased rank and form, I was the second youngest student in the school–and kept my mouth shut while I just waited for Sifu to decide when I got to learn next, and what it would be. When our lessons first began a regular schedule, Sifu just told me to come to the gym to clean up and practice. That was the result of me dusting my pants while practicing splits. Stanley Dea was teaching, and we were stretching while Sifu sat in the front and watched. He asked why I was moving and I told him the floor was dirty. He chastised the entire class for the school being dirty. After class my brother and I cleaned the floor, and we received our first instruction. It was a Saturday, and Sifu was in the office fussing at the instructors. He came in and told us to practice when we were done. Some time later he came in to explain the horse stance to us and how it was used to generate power in punching. He later told me that he was impressed with the length of time my brother and I practiced, that he rarely saw children so young practice without complaining. After a few hit-or-miss training sessions with him, Sifu pulled me in the office with Sifu Wong. He told me that if he were to teach me, I needed to teach the art forever, that the lessons with him were more expensive than any other lessons I could find anywhere. Basically, I would owe my life for them, and I agreed. I was 13. I was to stick close to Raymond, and Sifu would come down on Sundays for practice after the regular scheduled class. Every Sunday led to several days after school, and that led to lessons at his house–and that led to the conversations, which seemed trivial then. Yet years later I see that they were just as valuable as the lessons. I was already an advanced beginner when my one-on-one lessons began, and Sifu first retaught me my basics. complaining that I had moved too quickly. (And prior to that, I thought I was learning too slow! It took me a year to learn our first form) But once I had gathered the courage to ask Sifu for more instruction, and he agreed, teaching me forms that were not “on the list”. Yet by the time I was in high school, I had learned half the curriculum. I was able to meet and train with his uncle. When he had visitors, I got to learn from them as well. When I was 14, I told Sifu that I would have to work a part time job in my family’s store because my mother was paying for my lessons to three martial arts schools and I had to pitch in. Sifu waived my tuition for life, telling me to see Raymond Wong and Craig Lee if anything happened to him. One year later, Sifu was dead. During that last year, I became fond of the smell of Dong Quai and Onion soup. I could drink the soup, but warned to stay away from the tea. He said it was not for children, and was more medicine for headaches and blood, rather than a drink (Sifu actually enjoyed wine). I use to equate cigar smoke and incense with training, and soup with wisdom. I learned that the martial arts is not a business arrangement after you get through the fundamentals. Once you reach a foundation in the art, it becomes a relationship. You can’t pay for this kind of thing; you don’t need a business arrangement for it. You don’t need a term to describe it. You don’t even arrive with expectations. You simply commit to learning, and when the student is ready, the Master appears. When you literally sit at the feet of the teacher, you will learn things that cannot come from a book. You must be patient. You must be willing to come to the gym, practice for hours, and sometimes do that for several sessions without “learning” anything new. Then one day, years in the future, you will look back and realize you had received some of the most valuable instruction money can’t buy. Sifu left us too soon, but everyone who came away with a piece of the Dean Chin puzzle has a piece that is worth more than gold or silver. If you would like to learn more about Dean Chin’s Jow Ga, I would strongly encourage you to look up each of his students who are teaching and spend time with them. Everyone–Sifus Momenan, Henderson, Bennett, Hon Lee, Mims, Hoy Lee, Rahim Muhammad, Troy Williams, Raymond Wong, Deric Johnson, Brighthapt, Howard Davis, Wheeler, myself–we all have a part of Dean Chin’s unique fighting style. If you’re lucky, patient, and dedicated, you might get a good taste of what it was like learning from the Chinatown school in the days when Sifu Chin was teaching, and why his version of this art was so special. The passing of our Grandmaster, Sifu Chan Man Cheung is a sad one, but it does not have to be. My Si Gung lived a full and fulfilling, celebrated life. He was able to see his Jow Ga grow from his humble school in Hong Kong to an major force on the International Jow Ga Kung Fu scene. Most of the time someone sees a Jow Ga practitioner around the world–especially if you are an English speaker–they assume you came from his lineage. Cheung Sifu was fortunate enough to see generation after generation after generation spring from the loins of his teachings. Not only to know what and where his Jow Ga has gone; he was able to travel the world and actually meet those students and see the schools himself. Not bad for a man who was unlettered and not wealthy. One more thing. If you have students, make sure you talk to them about their duty in carrying this art forward. If the system had died with the founders there would be no Jow Ga today. Martial arts are an ever-evolving entity–and those in whose hands it is trusted have a duty to perfecting what they know, testing what they know, and unlocking its secrets so that your future generations will be given a better art than what was given to you. Just as your Sifu did for his or her students. Just as your Si Gung did for his students. Just as Master Cheung did for his students. That said, all of us who are in direct lineage to Grandmaster Cheung should be wearing a black armband for 30 – 90 days around our left upper arm, as a sign of mourning. However, like I said, do not let this period of mourning simply be one of sadness and “do-nothingness”, but one of celebrating the life of a great Master who gave each of us a Master who founded a very strong branch of this “one family”: The American Branch of Jow Ga. Dean Chin’s Jow Ga. Please make sure your students know where they came from, so they will have a direction for where they will go next. We have “Jow Ga” as a system, Jow Ga as a name as a result of mourning. Depending on which history of Jow Ga you subscribe to–our system was named Hung Tao Choy Mei when the art was taught to General Fook Lam’s soldiers. In 1919, when Si Jo Jow Lung died, his brothers renamed the art “Jow Ga” in memory of their brother, and Jow Biu took the reins to the art, opening 14 schools shortly after. Great things happen when you are motivated by love and mission. If you love this art and our leader, let’s see what great things you will accomplish next. We are one family, bigger than the original family that created this art. If we pull together, tightly, like the fingers to a fist (rather than open and spread out), we can crush rocks with it. Use this time to motivate yourself to doing something big. Thank you for visiting the Dean Chin’s Jow Ga Federation. So my Si Gung, Chan Man Cheung Sifu, has joined the ancestors. What a joyous occasion. Chan Man Cheung is one of the Jow Ga masters who had made his name as one who excelled in Kung Fu rather than Lion Dance. Yes, all Kung Fu masters do lion dance. Yes, Si Gung was known for his lion dance. But CMC what known for his martial arts skill, and he was not just an old guy who knew kung fu–he really was known for his good skill, and his ability followed him well into his old age. But none of that matters. Martial Arts, my friends is an individual activity. It is one where no one rides the bench–every man stands on his own feet, and his skill speaks for itself whether he is alone or with an opponent. Even if you are on a team, at some point your individual skill is what matters, not lineage. Not affiliation. Not title. Not organization. Your Sifu could have been the great Bruce Lee, and if your skill reminds onlookers of a wet noodle–your kung fu is “no good”. Si Gung was known for his skill, his students’ excellence–but none of that matters because it is up to you to build your own reputation and support the reputation of your own Sifu. CMC is simply an ancestor, and you cannot take him into a fight with you, a tournament ring, not even the office when you are attempting to convince potential students to join you rather than the guy down the street. Kung fu people get so much into certificates, lineages, affiliations and alignments–with both well-known masters as well as just someone just because they are Chinese–that we tend to forget the only thing that matters is what you can do when you step out on the floor and the level of character you have with those who are not on the floor with you. We Jow Ga people have our drama. We always will. We are a family–close, extended, love and hate. Many of us Sifu knew each other as kids. Some other Sifu knew us when we were kids. There will always be differences of opinions and philosophies, and there will always be those we simply don’t like. But we area all Jow Ga, and we either represent our Sifu, our grandmaster, or ultimately–each other. When outsiders look at us, they see every other Jow Ga man out there. When they see Sifu Deric Mims’ students, they also think of Sifu Rahim Muhammad and his people. When they look at Sifu Sam Chan, they also think of Sifu Raymond Wong. We are all Jow Ga, and don’t you forget it. Because when students go looking for a school, and they must choose between Tae Kwon Do, Wing Chun and JOW GA–not Tae Kwon Do, Wing Chun or Maurice Gatdula. Don’t flatter yourself. CMC was to all of us who knew him, a father. He gave advice, he scolded, he bragged. He loved our Sifu and was proud of him. He had said on a few times that when Dean Chin wanted to show off his students, he brought them to fight. Few other Jow Ga Sifu were like that. Few other KUNG FU Sifu were like that. Most simply donned their fanciest uniforms and weapons and titles, and demonstrated forms or Lion Dance, while Sifu made his guys suit up and knuckle up. CMC liked this about our Sifu, and we need to keep that going. As I look around the Jow Ga world, I see men who love to tell stories of Jow Lung’s exploits as a fighter, but then they get on youtube and only do forms and Lion Dance. That is not what drove our lineage forward. There is a reason why other branches of Jow Ga do tricks with their Lion Dance and Dragon Dance, while ours still wear plain T shirts and perform forms with heavy Kwan Dao. It’s in our DNA as Kung Fu men under Chan Man Cheung. Please, keep it alive. We don’t have to love each other. We don’t have to get together at functions and hug all over each other and act fake. But we do need to keep our skills high, and represent this style strongly. And if you feel like your branch of this branch is missing something–just remember that you have family all around you. The Dean Chin Jow Ga Federation is dedicated to spreading the Dean Chin version of Jow Ga under Chan Man Cheung, and we’d love to do it through our own brothers and sisters. All you have to do is ask. Thank you for visiting the DC Jow Ga Federation website. I pulled this information from http://www.NaamKyun.com’s website. Hope you find it interesting! 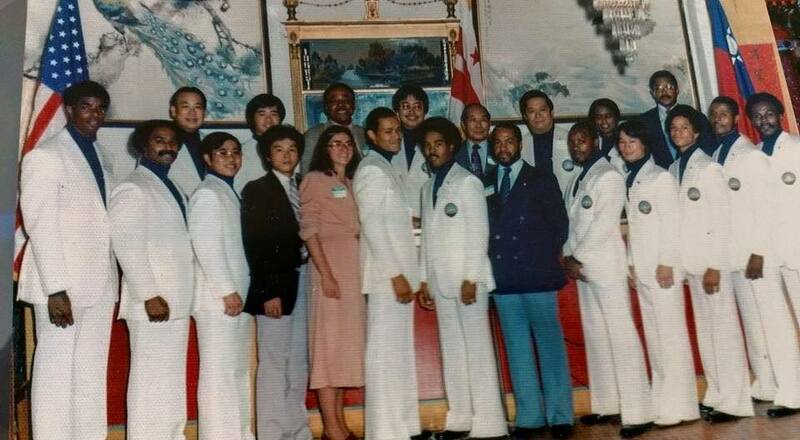 Sifu Chin only recognized a small handful of “Full Instructors” in his lifetime. His teaching time in DC lasted 16 years, and the last 3 – 4 years of that time he was only occasionally teaching formal classes. We rarely hear about the Full Instructors, which is surprising, because not only are they part of our history and lineage, these brothers had skill far above what we normally see in Kung Fu today. The bar was set high and those who met it were obvious among those who did not. I have some video I’d like to put to youtube and when you see it you will agree that Jow Ga of the early days was * very * strong. 1. Hoy Lee – Hoy is recognized as our senior, because Sifu had always honored him as the first student. He was also one of the best. When I learned from him I remember him giving me his interpretation of Jow Ga techniques for fighting, and I use his philosophy today. I was not fortunate to ever see him do any kung fu when he was young, but I know from what everyone said about him he was extremely good and an excellent kicker. He created the Stepping form (aka “Stance Training form”) with Deric Mims. 2. Paul Adkins – I use to call him “Black Superman” when I was a kid. He was very strong and fast, and from what I remember of his classes, a great technician. Out of all the instructors and assistant instructors he taught the best fighting strategy, along with Tehran Brighthapt and Lemuel Talley. I can’t rank my opinion of him above Bright or Talley because I didn’t train with him as often as them, but I remember that Paul’s classes did not involve any boxing or wing chun (Sifu taught wing chun occasionally)–but did have some Moo Doo Kwan if I remember correctly. I once asked him what form he liked the most for fighting, he said “perfect form”. I was about 12 or 13 and it stayed with me all these years. 3. Hon Lee – I believe he started right around the same time Hoy started, so he is our second in command. Hon was a Marine, I believe, so you know he was a beast. When I joined, Hon was in China studying, and occasionally came back to the U.S., and fortunately I was one of the folks who got to learn from him. Hon reminded me of Sifu in that he taught fighting technique directly from the form. While we always learned applications from the form, when Hon taught he taught those same techniques as fighting techniques. I remember practicing a technique for about an hour while he called cadence, and after about 20 minutes or so he showed us how the technique looked in the form. In the form??? It was eye-opening, and I always respected him for that. At that time, I was seeing forms as just that–forms. But he opened my eyes to the potential of our kung fu. I didn’t spend a lot of time with him, and only had a few conversations as an adult, but he is a very wise man and every Jow Ga student should at least meet him. 4. Deric Mims – He was our forms specialist. Deric had a great eye for detail, and his skill embodied what Jow Ga was all about. He was a great combination of Northern and Southern, which few of us had (I believe we leaned perhaps too much towards southern style), and if you stayed under him long enough you ended up with flawless form. One thing I remember from watching Deric’s Tues-Thurs crew was that all of his regulars were championship material. There was a “Deric Mims” look to everything he did, and everyone (including me) who learned from him showed it. This is just my opinion, but his three top students were Stephanie Dea, Troy, and DJ. I once heard someone say that Deric was Mims’ Tiger, Troy was his Leopard, and Stephanie was his Crane. This was a pretty accurate description, Deric for strength, Troy for speed and Stephanie for gracefulness. Deric was also our business manager, and he kept Jow Ga a professional run organization, and certainly was responsible for keeping our lights on. 5. Raymond Wong – I think I wrote enough of him on the “History” thread. This was the guy I stuck to when I joined. A story: When my brother and I first came to Jow Ga, Sifu told my mother we were too young. We left, visited a few schools and didn’t like any of them. Mind you, I had not seen any of Jow Ga’s skill, just the office. But something attracted me. I had called once and John Chin answered and helped me with a project I was doing for school (I was in the 6th grade) “What I want to be when I grow up” (Martial Arts teacher). We were going to Wah Hsing and I convinced my family to go back to Jow Ga. When we came in, Sifu was starting to kick us out again, and Raymond stopped us and talked to us. We signed up, and John Chin taught my first class, Rahim Muhammad taught my second class. When I started learning from Sifu himself, he told me to stick close to Raymond and I did. He is, in my opinion, the spitting image of Sifu in the way he taught and treated his Kung Fu. Raymond was known by most of the students as “the Lion Dance” guy because it was the only time they saw him. He did not come to the school during the week, he was almost never seen doing kung fu and when he taught it was often hours after leaving the club. But his kung fu was top notch, as is evidenced by his students. In the old days Raymond had three top students who followed him as well–Moo and San Wong (his nephews) and me. 6. Randy Bennett – I didn’t know him well so I can’t say much about his kung fu. But from what everyone says about Randy, his Kung Fu was certainly very good and typical of a first generation DC Jow Ga person. I don’t know if he has youtube clips of himself, but I’ve seen home movies and his technique was flawless–and I totally mean that. Even now at his age he is that good. He came to visit DC in the late 90s and everyone was in awe, especially those who had never seen any of the first generation Sifus. 7. Eugene Mackie – I know this brother VERY well. He and Craig Lee were the last of the Full Instructors on Sifu’s watch and all I can say is most Kung Fu people have never seen skill this good. He had knee problems early on but would push it and train and demonstrate anyway. When Eugene gave, he gave 100% intensity. He had very strong hand technique, very clean hand technique, and when you saw him do a form, you could tell he could also fight with what he had. The video on youtube with all of us does him no justice, he was good but man you should have seen him back in the day. Because of his power, he was the Tiger to Craig Lee’s Leopard. Of the crew he was second youngest. 8. Craig Lee – I know him well also. Almost everything on the 28-form list past Double Broadsword, I learned from Craig, and he is the only Full Instructor I speak to regularly. Anyone who knew him will agree with this statement: Craig was our best forms specialist. I will put up a clip that he and I made in Chinatown a few years before Sifu Chin died, and you guys can see for yourself. Everything from the stances, to his execution to speed–whenever Craig performed he made all the older guys proud, and it made us young cats go in the classroom and train our asses off. He was Sifu Chin’s youngest and last full instructor. He and Eugene were promoted in 82. Considering that Sifu died in 1985, these were honors he did not freely impart. There were a few Assistant Instructors, and I’ll post them later. But 8 Full Instructors in 16 years says a lot about why Jow Ga is the way it is now. I know of teachers who put out more than 8 Black Belt students a month. You didn’t become a Sifu just because you knew forms, and you literally had to be the best of the best. One thing about our seniors in the system–they were all several heads above their peers in the martial arts community in skill and fighting ability. Our assistants from those days were Tigers: Rahim, Bright, Howard, etc. but those who were Full Instructors really stood out. They earned their place not just by being around long enough or learning the curriculum, but perfecting what they knew. Thank you for visiting DC Jow Ga Federation. In order to help you understand who Dean Chin is, and why he is significant in the Jow Ga world, it is would be most appropriate for you to see how Sifu Chin’s direct students looked. We could write beautiful articles about Sifu’s exploits and how good he was as a teacher. Yet nothing proves a point better than a point “demonstrated”. Hopefully, this clip tells the story better than any 700-word essay.